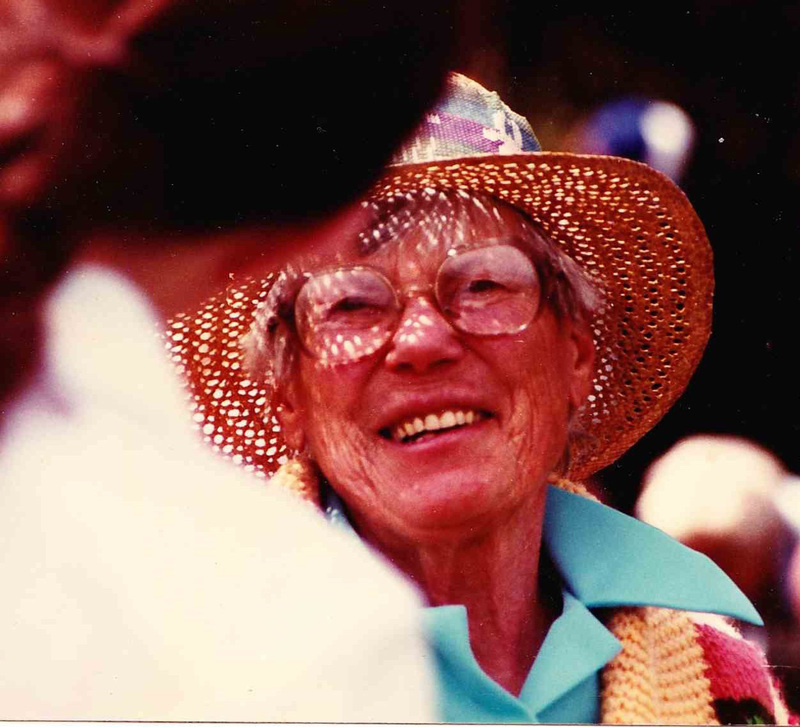 Bee Warburton received the American Iris Society Hybridizer Award in 1966. The Foster Memorial Plaque was instituted in 1926 in recognition of Sir Michael Foster's "achievements and assiduous efforts in collecting and hybridizing irises," and is reserved by the British Iris Society for special personal awards to people of any nationality who contribute to the advance of the genus Iris. This year is was awarded to Bee Warburton, and no one could deserve it more. Born and raised in the Boston area, Beatrice Clarke graduated from Girl's Latin School (six years of Latin, three of Greek) and went to Barnard College on scholarship, majoring in chemistry with expectations of becoming a doctor. Her father's death during her second year forced a change of plans. She took a hasty secretarial course and got a job as a medical technician. At about this time young Frank Warburton was attending M.I.T., and Fate put the two on the same trolley line. Soon Frank was doing his homework at Bee's house-and he's been doing it ever since. Bee and Frank celebrated their 50th wedding anniversary this past January at a party given by their three children and attended by most of their ten grandchildren and a host of friends. They have two daughters, one a college professor and the other assistant director of a nonprofit organization for helping juveniles in court. Their son is a physicist at Brookhaven on Long Island, New York. David, their oldest grandson, is also an AIS member whose prime interest is in photographing irises. Bee says, "One thing I know-leaving a college degree unfinished is probably the strongest incentive to keep on learning all your life. All the time the children were growing up, I thought that plant breeding would be an absorbing occupation, but we were never in one place long enough. I always grew something; one year it was nothing but an enormous four-leaf clover plant. "When we came home from the war and decided to build on Frank's father's land, I cleaned up and planted the rock garden before we had the house finished. I chose irises to hybridize because I wanted some small ones and couldn't find any I thought worth growing compared to the available tall beardeds. First I tried breeding for small TBs, to make the dwarfs smaller; then I tried growing pumila seed; and then I crossed them together. I've introduced a lot of varieties since 'Brassie' but none that pleased me more, because I had selected both its parents from my own seedlings, and that, I felt, made me a real hybridizer." The rest is History: Cook-Douglas Medal, 1966 for 'Blue Denim'; 1967 for 'Blueberry Muffins', 1969 for 'Bassie'; Caparne Award, 1968 for 'Sky Caper'; Knowlton Medal, 1972 for 'Lace Valentine'. Bee has also won medals at Florence, Hamburg, and Vienna for her irises. 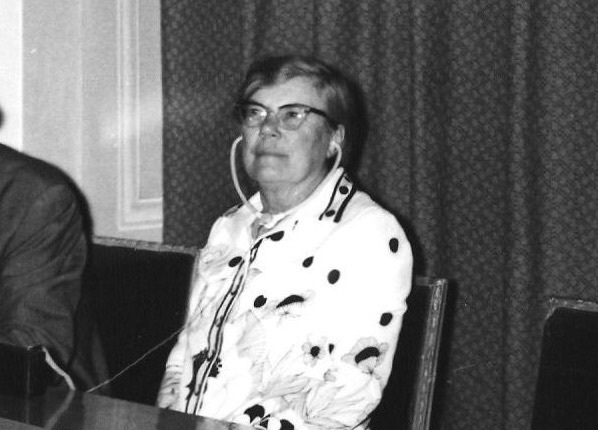 She received the AIS Hybridizers Medal in 1966, and in 1972 she was awarded the Society's Distinguished Service Medal. It is our opinion, however, that Bee's greatest contribution to the genus has been as a publicist, especially for the median irises. Her writings have appeared frequently in these pages and in the BIS Year Book and have been translated into other languages for nonEnglish- speaking readers. 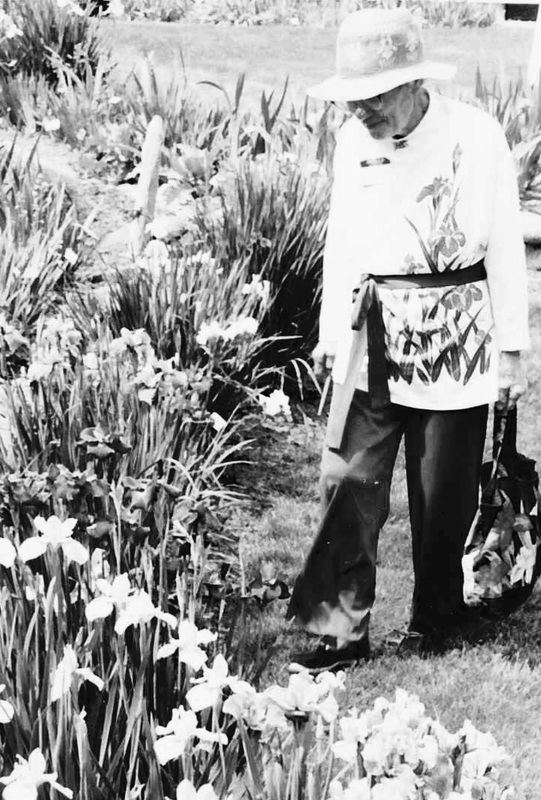 She presented an in-depth report at the International Symposium on Irises in Prague in 1974 on the subject of the contribution of species irises to modern median irises. As editor of "The Medianite" she had a chance to "spread the good word" and made that publication one of the best in irisdom, and now, as editor of The World of Irises, she is drawing on all her years as hybridizer, writer, speaker, and editor to create what will surely be her masterpiece. In case this makes Bee appear all intellect and no heart, let me assure you that she is delightfully human-kind, generous, warm, and witty. The Warburtons keep a perpetual "open house" at their big comfortable home in Westborough, MA, where friends are always welcome. Our Region 1 auctions are held annually under their sheltering apple trees, with Frank's fresh-picked corn on the cob as an added attraction. Intermediate Bearded: 'Alexandra Beth', 'Annikins', 'Berry Parfait', 'Blue Icing', 'Celia Kay', 'Con Brio', 'Dandelion', 'Dark Blizzard', 'Dilly Dilly', 'Fancy Caper', 'Favorite Song', 'Flourish', 'Frosted Cups', 'Maroon Caper', 'Proper Lemon', 'Ruby Rose', 'Sandy Caper', 'Snappie', 'Sugar', 'Sunny Favor', 'Sweetie', 'White Lilacs'. Minature Dwarf Bearded: 'Already', 'Arrowhead', 'Barrette', 'Blue Doll', 'Busy Child', 'Lemon Doll', 'Sky Caper', 'Slimbo', ''Tiny Taurus', 'Trey of Hearts'. Minature Tall Bearded: 'AstrachanicaKalmikij', 'Gabi', 'Tyke'. Siberian: 'All In Stipple', 'Atoll', 'Bellissima', 'Blue Song', 'Bountiful Violet', 'Dancer's Fan', 'Deep Shade', 'Fine Tuned', 'George Henry', 'Isabelle', 'Mad Magenta', 'Navy Fanfare', 'Percherette', 'Percheron', 'Purple Prose', 'Reprise', 'Rosace', 'Shadow Lake', 'Silver Rose', 'Sky Mirror', 'Springs Brook', 'Stars by Day', 'Stellar Blue', 'Tweed', 'Vi In Pearls', 'Vicki Ann', 'Visual Treat', 'Whirl', 'White Triangles', 'Wings Away', 'Young Lady'. Warburton, B. (1957). Median Irises–for Gardens Everywhere, The Iris Year Book 1957, p.114-121. Warburton, B. (1957). Use of Pumila in Iris Breeding, Bulletin of the American Iris Society, No. 147, p. 47-53. October, 1957. Warburton, B., (1959), New and different–Iris Kamaonensis, Bulletin of the American Iris Society, No. 152, p.65-66, January, 1959..
Warburton, B., (1971), Paul Cook's Wide Iris World, Bulletin of the American Iris Society, No. 202, p.45-65. Iris imbricata. Warburton, B., (1972), Is Iris Aphylla Remontant, Medianite, vol. 13, No. 4, October 1972. 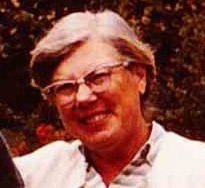 Warburton, B., (1978), Versicolors, Region 1 Bulletin. Warburton, B., (1985), Anybody for collecting Iris pumila on Crete, SIGNA, p.1215.